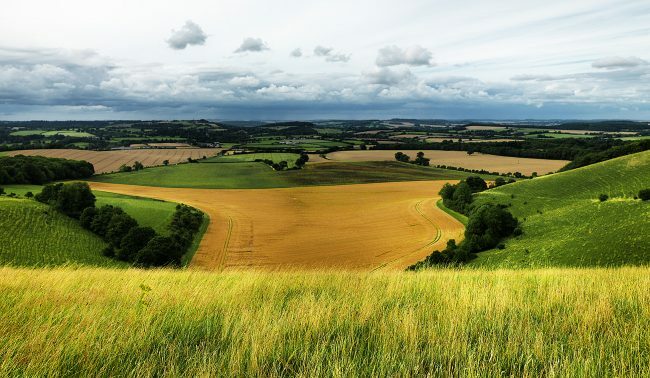 For many years I tried to include a Light and Land workshop with my travels to the UK – this year I got my wish – in spades: a one on one with the master himself, Charlie Waite. Charlie met Cathy, my wife, and I at the Gillingham train station and drove us to the Grosvenor Hotel in Shaftesbury, a nearby town in Dorset. We sat together in the hotel lobby and planned our day quite quickly, exchanging books and then Charlie presented me with his ‘crib-sheet’: a list of landscape photographic tips. 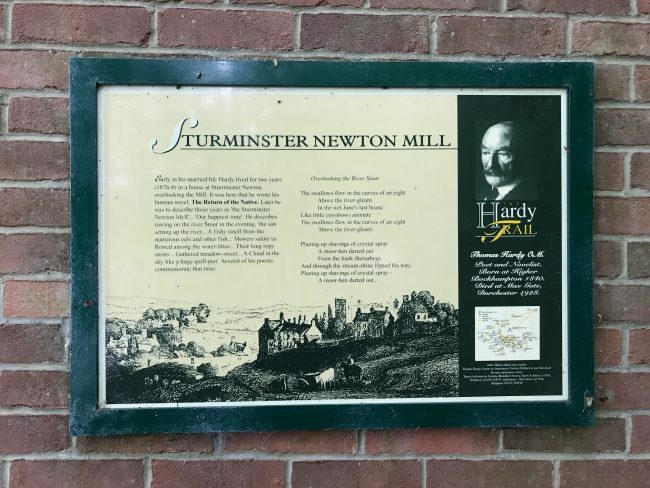 Being mindful of the rapidly changing weather we set off before noon to our first destination: Sturminister Newton Mill, fabled to have housed Thomas Hardy poet and novelist. 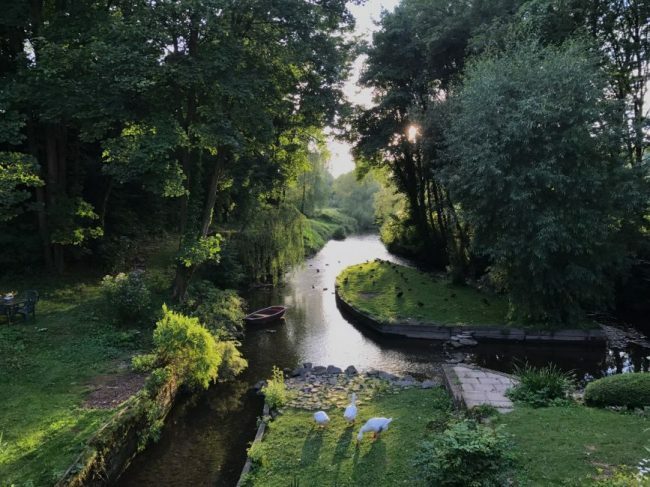 The weir at the mill controls the water level along the River Stour, a 98 km long river, which rises at a place called Stourhead and meanders its way down to the sea at Christchurch via Eccliffe Mill and onwards to Stourhead Newton Mill before making its way to the English Channel. Because the weather was changeable the light was not the best for the scene. Nevertheless a slice of light illuminated the tree on the left that anchored the composition of simple elements; the house along the river, framed by the reeds and river moss in the foreground, the line of trees in the background and anchored on either side by the tree and the bridge over the weir. While walking across the bridge to take the first image we came across a ‘tight-view’ of the house and the cascading water at the weir. By now the weather was changing rapidly and I managed to catch a blue sky and waited for the small puff of cloud to enter the space in the sky just above the gable end of the roof. I chose an aperture of ƒ32 to get maximum depth of field to capture the shadows from the leaves on the moss in the foreground and the trees that frame both sides. With two images under our belt it was time to satisfy my rapidly increasing appetite. 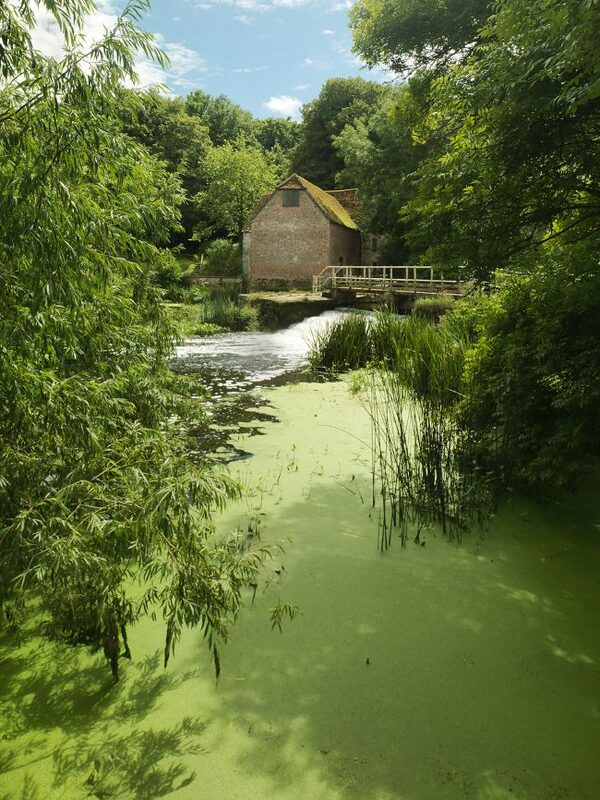 So off we went to eat a sandwich at Charlie’s home at Eccliffe Mill, also situated along the River Stour, downstream from the Sturminister Newton Mill. What a tremendously picturesque property overlooking the river, a suitable home for Charlie Waite. Apparently I was quite privileged to be a guest there, to meet his personal assistant Cecilia and to see Charlie’s studio where he makes many stunning prints for exhibitions. 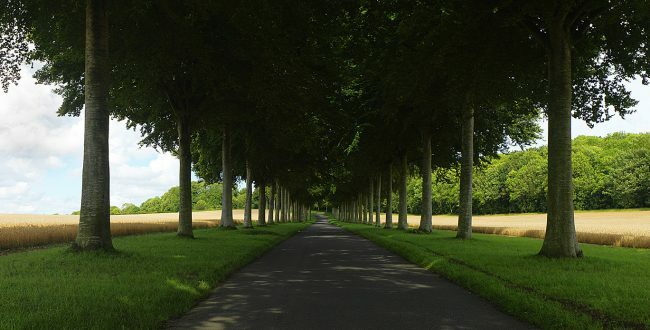 We then set off to one of Charlie’s secret vistas: a tree-lined avenue near Moor Crichel, a village and civil parish in East Dorset, some five miles east of Blandford Forum. 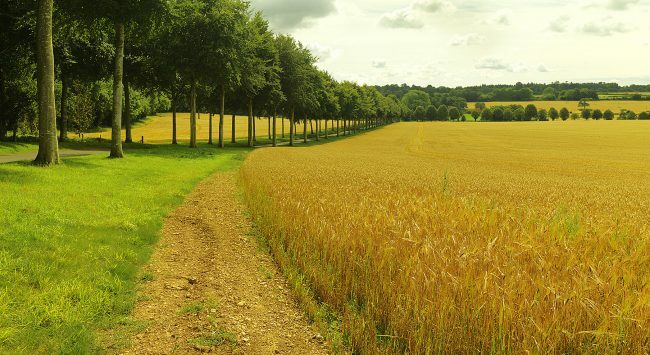 My favorite image is the axial view along the avenue of trees with the line of yellow corn slicing through the tree trunks with mottled shadows in the foreground. 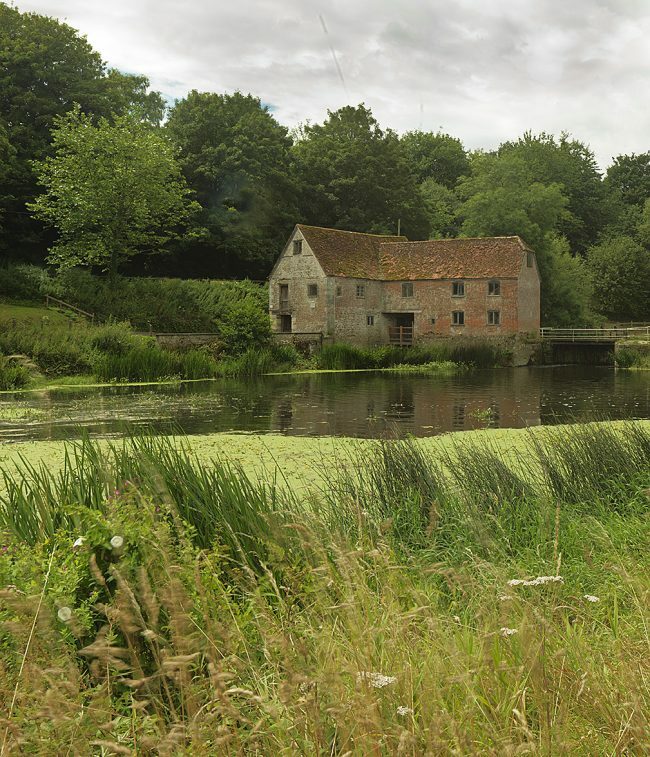 Our final image of the amphitheater was taken from Win Green east of Shaftesbury. The weather had now changed again and became overcast which was a pity as I just snapped the image thinking it was not worth it – only to discover that the final image was surprisingly better than I originally thought. I should have taken more time and moved closer to the edge of the hillside to capture the full effect of the amphitheater. Charlie himself has photographed and published this scene in his many books and exhibitions. Charlie’s accolades as a photographer were briefly covered in Blog 30.1 but I will just say that it was a real pleasure to meet him in person. Charlie is a great teacher and truly passionate about landscape photography. He is also a very nice person with a great sense of humor – I think we got on well and I look forward to meeting him again in the not too distant future.